CodeBench 0.55 released for both AmigaOS4SDK and Hollywood. CodeBench 0.42 released for both AmigaOS4SDK and Hollywood. The site and documentation given a slight redesign. Introduced the dedicated Contact page. CodeBench 0.23 now available which fixes a couple of outstanding issues. Finally CodeBench 0.22 now available for public download. Updated the documentation and related images to include some new functionality. Updated the documentation to include a description of the synchronising plugins, and the SVN Tool in particular. Added the FAQ section, which includes a list of recommended resources and websites for beginners. Updated the documentation to include the latest developments. We would like to officially thank all those that nominated us, and those that voted for us at the recent developer awards at the AmiWest show. 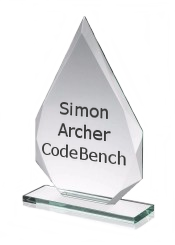 They voted CodeBench (and its sister application AmiUpdate) "First among equals". Simon Archer is very honoured to accept this award on behalf of the whole team. Feedback from our users is very important to us, so this award makes our hard work all the more worthwhile. On behalf of the developers, the testers and the support team - "A big Thank you to all". Check the ENVARC:Classes/Gadgets/RichEditor drawer, there should be a file there called "default.kbd". This is the file that contains the keyboard mappings. Unfortunately it is not being installed on systems without a previous CodeBench installation. This file is mirrored in the "configs" drawer within the CodeBench installation. Simply copy it to the ENVARC: drawer listed above and reboot. Yes, after all this time, we eventually got there. Just in time for this years AmiWest show, and to coincide with the new release of the AmigaOS4 SDK, we have the greatest pleasure in bringing you CodeBench 0.42. There are lots of new features, so take your time to read through the documentation, and if you have any problems, please post to the support forums using your shiny new "CodeBench Community" account. Have fun, and thanks for your patience. "Pinch and a punch, for the first day of the month!" Yes, we are still alive, and yet another month or two flies by without stopping. Anyway, if you are one of the people attending, have fun, I'm sure they'll be plenty to keep you busy. You know, we just have no idea where the time goes. Things are progressing nicely, and we are rewriting various parts that date back to the very start, hence yet another hold up. While that doesn't help out those of you eagerly awaiting a new update, it should hopefully fill you with warm fuzzy feelings that we are doing our best to bring you the best product we can. We are fully aware just how long it has taken since the last update, and we can only apologise for that. The unfortunate part is we just cannot stop adding features. This adds to the testing workload and holds up any chance of an update, we just hope you feel the update will be worth the wait once it arrives. We have set up a proper bug tracking system internally now, so that has improved the speed of bug reporting and fixing, and once the rewriting of the code sections is complete, we shall be working to empty the bug tracker. Well, first things first, Happy New Year to you all, and we hope you got some nice stuff for christmas! As usual, we've been hard at work trying to get a new version out. We were aiming at early November, and in typical style, missed it. It has, however, given us more time to really look into some of those nasty bugs that have been really hard to find, and we are pleased with the result. So much so, the latest version has gone into internal beta-testing with the aim of making this the released public version in the very near future. We will also be busy during this time setting up an update database so that we can get fixes and upgrades out much quicker and more often. This will use the AmiUpdate tool that shipped with AmigaOS 4.1 Update 6. In the meantime, our testing team will be putting CodeBench through it's paces so we can hopefully give you the update you so deserve (Yes, we know it's been over a year, don't remind us - ed). We will release details about the update server once it is up and running. In the meantime, try to stick to those new year resolutions folks. In response to the programming seminars which took place at AmiWest recently, we have been burning the midnight oil over here at CodeBench towers trying to release a new public version for you to play with. Needless to say, we did not make it. We have been spending so much time on testing the internal beta versions, we neglected to test the public builds, and these have proven to be quite broken. It took a lot longer than anticipated to fix these problems, coupled with the rather outdated build system for the public versions, we simply ran out of time. However, we have taken this ooportunity to add some rather nifty new features which we hope you will all find useful once you get to use them. Progress has been good though, and we should hopefully have the new version out within a short time. Sorry for missing this (self-imposed) deadline, but we hope the wait will be worth it.